Did you ever notice, in your genealogy software, how some months are — um — how shall The Legal Genealogist put this…? — er… more active, in family history terms? There’s certainly a tradition for June brides, driven no doubt by weather considerations: if the skies are clear and the cricks don’t rise, people can come out to a wedding celebration. And we won’t go into the fact that my immediate family is the exception to the rule, of course: my mother, for example, was born on March 21, but she was the fifth-born child of parents who’d married in October some nine years earlier; my sister Diana was born on March 13, but our parents married in January of the year before; I was born on March 19 two years later. But hey…. it’s family Saturday here at The Legal Genealogist, so we’re not going to let the facts get in the way of a good story, are we? And so it is that I posit a possible explanation for a phenomenon I always notice, with a smile, in my own genealogy records. • My cousin Sheila, younger daughter of my Aunt Marianne, was born on November 1st. • My fifth great grandmother, Dorothy (Davenport) Baker, was born on November 2nd. • My great uncle Fred Robertson, brother of my grandmother Opal (Robertson) Cottrell, was born on November 3rd. • A cousin Leona Baker on November 5th. • A great aunt Effalie Cottrell on November 6th. • My second great grandfather Gustavus B. Robertson on November 7th. • My mother’s oldest brother, my Uncle Bill, on November 8th. The roll call continues through November right up to today, November 19th, when I pause with a smile. • My mother’s older brother, my Uncle Monte, on November 19th. Monte Boyd Cottrell, born in 1923.1 He of the infectious smile and the gentle hands. Monte of the big laugh and quiet voice. Monte who introduced me to hot peppers (hot! burn-your-lips-what-was-he-thinking-how-does-anybody-eat-these hot!) and roller-skating penguins (an exhibit at the San Diego Zoo in the late 1960s). 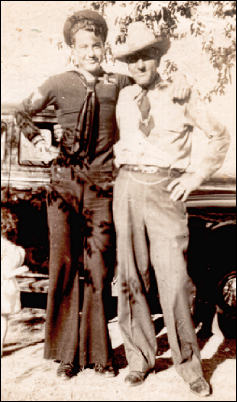 Monte… who would never ever tell you himself how he had just turned 18 when Pearl Harbor was bombed and he joined his older brother, my uncle Billy, in the United States Navy. Monte’s military records show that he was a Gunner’s Mate 2/c in the U.S. Navy Armed Guard. Until I did some reading up, I had no clue what the Armed Guard was. It turns out that its role was to man the guns on the thousands of Merchant Marine ships bringing men and materiel to the various war zones — troop ships, cargo ships, tankers and more. When the convoys came under fire, as they so often did, the difference between life and death was often the Armed Guard. In the darkness, … the gunners were left afloat, each in his life preserver. … They became separated, each floating around by himself and finally lost entirely to one another. The gunners weren’t picked up by the fishing vessel until they’d been in the water seven or eight hours. They were landed in Morgan City, Louisiana. He would have turned 93 today, this gentle funny man… and he wouldn’t have been part of our family story but for some February cuddles. Keep that in mind when the weather turns and the snow falls and the wind howls. We have a glut of birthdays at the end of Novemner. Grandson Dylan 26th, maternal grandmother 28th, both her husband and mine 30th. The latter two get to share their birthday with Winston Churchill and Mark Twain. I get to share mine with explorer David Livingston and Supreme Court Chief Justice Earl Warren! In Manitoba, we blame November birthdays on February snowstorms. I’m Nov 24. My wife is Nov 14. You and my brother Fred and two of our cousins can all wave birthday greetings at each other next Thursday! You sure called it, Judy! My first grandchild was born on November 4, 2016, on my milestone birthday. He just missed his mother’s (my daughter) birthday, November 1. Something very special about those February cuddles. Congratulations on the first grandbaby! Fantastic story about your Uncle, thanks for sharing! In my family — both parents — it’s May. I figured it was something in August. Dog days? My parents were married in September. My dad strongly believed that a couple should have two years to get to know each other before they had children. They must have gotten a bit of a head start, because I, their eldest, was born the end of August, two years later. That summer was hotter than usual, and my mother didn’t like being pregnant in the summer. So my siblings were both born in April. The fourth would have been, too, but my mother miscarried. Your story about your uncle is terrific. You were so lucky that he survived and you got to know him, hot peppers and all. Two of my mother’s cousins enlisted in the Merchant Marines immediately after high school graduation. The younger was the only person the extended family lost in WW II, at less than 20. That was all I knew about it, except that he was still mourned at every family gathering. I found a website where volunteers posted information on people who died in each branch of the service. The first thing I learned was that the Merchant Marines and the Coast Guard had the highest percentage loss of life in WW II. The Merchant Marines because the other side knew the US needed every gun, tank, ration, and pair of boots and socks in order to fight. I found the ship Leigh was on. It too went down in the Gulf of Mexico, very early in the war. When I told my second cousin, Leigh’s niece,what I’d found, I heard the rest of the story. As soon as the ship went down, the German submarine came back and rescued all the survivors, dropping them off on land. Leigh had been in an over-crowded lifeboat the captain watched capsize. The captain’s sister was engaged to Leigh, so at least he could tell her exactly what happened. Sorry to be a stickler, but it’s Fort Rosecrans, not Rosencrans. Great story, enjoyed reliving your Uncle’s exploits! So we should check the weather 9 months back of when we were born? Myself, a daughter, her husband, my maternal grandmother were all born on Nov. 20th. Plus two female ancestors. I will check the newspaper weather reports! I need to look at my Down Under records. Not that our weather is as cold but it should mean March or Feb births 🙂 and there’s the Easter brides to factor in.